So, what is all of this? 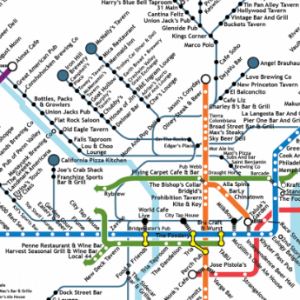 On this humble website, you will find recreated transit maps featuring the best beer bars in the city. Their names appear in place of real transit stations, so it may be helpful to have an actual subway map with you as well, unless perhaps… you really want to just go out and explore some cool and exciting places that your town has to offer. And all for just a single ride fare on the train. Not sure what we’re on about? 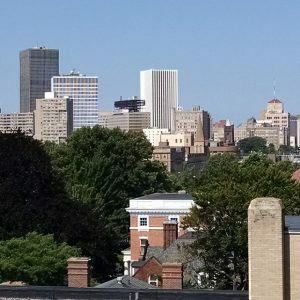 Well, the basic idea is to get people out exploring their city, whether they are life long residents, or recently graduated job seekers, with the premise of finding the best beer bar (and of course, the best beers), that their town has to offer. Not only that, this also helps people find legitimate reasons to try something other than the same old place, over and over and over. And by utilizing existing public transportation systems, we hopefully help some potential drunk drivers stay off the road. Our familiarity with the city and its craft brewing/beer bar proliferation. Existence and scope of a proper mass transit system, especially rapid transit systems. Population, tourism industry, and global importance of the city. Some larger cities employ multiple transit networks to move people about. In this case, we may either include only the main rapid transit network (as in the case of Montreal), or we may include all of them (as we did in Boston). We may also only include parts of certain networks in conjunction with the entirety of others (this was done for Philadelphia). 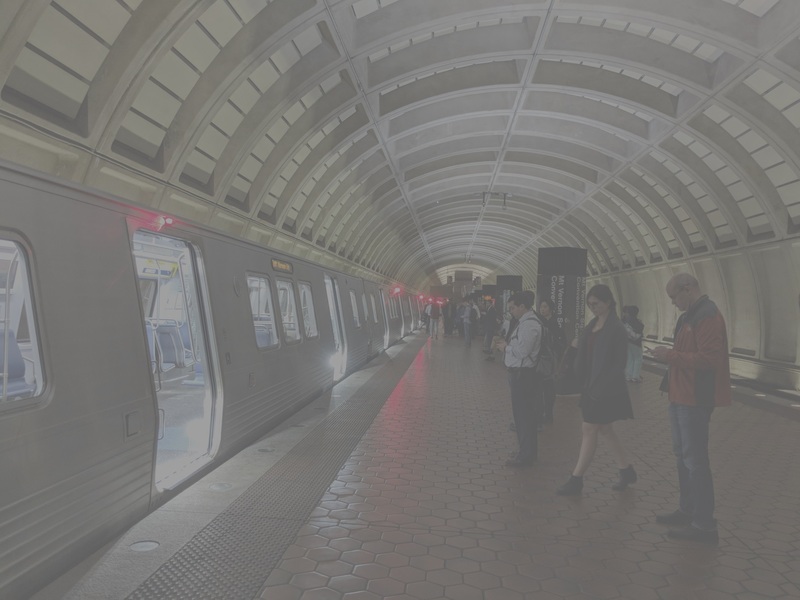 The decision to include or exclude certain aspects of a total transportation system depends on the importance of those aspects as well as the availability of workable maps which include those separate systems. 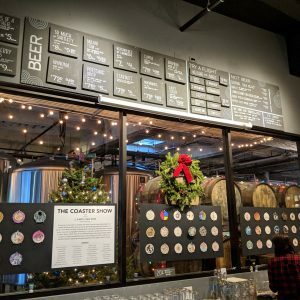 Some cities may have impressive beer bar scenes without the presence of many craft breweries within city limits (such as Hoboken). On the other hand, another city may have a disproportionately large amount of breweries domiciled there (as does Denver). As we do in fact exist only because breweries exist, we do place a greater emphasis on the creators of great beer. This includes brewing facilities which may or may not offer tours, tastings, or retail of any kind. This also includes the range of brewpubs which exist in every city with a good beer scene. We include all known breweries and brewpubs on our Pubway Maps, regardless of the ratings of their beers. This means that we may include them as either actual Pubway stations, or as standalone stops. Some breweries may exist near a station where an actual beer bar is also located. In this case, we’ll add the brewery as an isolated stop in the Pubway, but not along a route per se. This is also the case in which a brewery may be geographically located within the expanse of the Pubway Map, but not located near an existing route. Peripherals such as Food, Glasses, Atmosphere, etc. What cities do we plan on doing next? As stated above, we select cities based on familiarity and specific requests. Yes, this would most likely explain why we thought creating one for Rochester, NY, which hasn’t operated a real subway since the 1950s, before Los Angeles, CA was a prudent decision. We do have a list of proposed and upcoming Pubway Maps, but if you want us to create one for your city sooner, drop us a line and maybe we’ll give it a whirl. Would you like to see your bar/brewery featured? Perhaps the only thing that remains unchanged throughout life is the fact that change is inevitable. Bars close, and new ones open. Beer menus change, and so does management. While we do initially base our selections on the formula above, we can make friendly amendments when we deem them necessary. If you own or work at an establishment that serves/produces beer, but don’t see it on our Pubway Maps, you can email us and make a case for yourself. 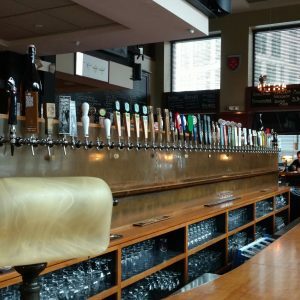 You may have added some new awesome beer taps, or perhaps your restaurant now offers flights or unique beer pairings. Whatever the reason, if we decide that your new/changed bar/brewery is a particular station’s best beer bar, we’ll update the map and publish it for the world to see. This site began as a sister site for our main beer review website, Unquestionable Taste, which strives to help visitors find their new favorite beer. We began with recreating the Boston MBTA “T” Map, which features some of the best beer bars in the country. Going along the same theme, The Pubway strives to help people find their new favorite pub, in the life long quest to find their new favorite beer. Never settle for what you know is good. With over 2,000 breweries in the United States alone (with many more sprouting up every year), there’s always something better out there, waiting to be discovered. The after work relief, a night out with friends, a crucial playoff game, a casual business meeting, a pre/post interview pick me up, exploring a new part of town, a good time. There are many reasons why us beer lovers appreciate and respect a good watering hole. The Public House or Pub for short is a gathering place. A community oriented nexus of social activity and small business. A place where you can hang out with old friends, or make new ones. A place with good food, exciting sports, fun games, and friendly staff. You won’t have to pay a $135 cover for some Bud Light Lime infested, overcrowded sweat joint that plays horribly executed remixes of tasteless pop music. And you certainly won’t have any problems hearing yourself think. In fact, the pub is a place for thinkers. A place for ideas. Business models, inventions, political resolutions. Friendship, and love. The pub is a place where you feel welcome to express yourself. And not all pubs are the same. Some are bigger than others, serve more food than others, and play different music altogether. But no matter what your favorite pub(s) are like, they’re special. They’re a second living room. A second kitchen. And sometimes, a second bedroom. But most importantly, they serve beer. And while clubs and restaurants focus on diluted cocktails and wine respectively, the real pub takes pride in real beer. Good beer. Local beer. And sometimes, beer from far. But what if you don’t have a favorite pub? What if you’re reading this verbose introduction to some reinvented rapid transit maps, and you have no idea what we’re on about? Well fortunately, you’ve come to the right place. We will be continuously recreating the subway/rapid transit maps of various cities around the world, focusing on the best beer bars and pubs that those cities have to offer. Each station within the network will have its name replaced by the name of the pub or bar/restaurant with the best beer selection nearest to it. The idea is multi-faceted. You get to learn about new places where you can find great beers. Small businesses get their names out for beer lovers to discover. We prefer public transport because while it’s not as fun as a car, it’s better for the environment, and we categorically oppose drinking and driving (as should everyone, even lawyers). And if you are one of those people who may have moved to a new place recently, or still can’t make a decision after years of searching, perhaps this new kind of map will help you narrow that search. As you’re probably aware, we’ll always encourage you to try new beers. The next one you try could be your new favorite. But there’s always something new to try. There’s always a new pub to visit, a new part of town to explore. So warm up your subway pass, pick a new place to discover, and go.